As Christians we often confess that we’re sinners – we understand and accept that we are sinners. But how many of us truly understand the depth of sinfulness that permeates our hearts? Who can understand the human heart? Even we ourselves, as the ‘owners’ of our own hearts, do not know the depth of the black hole that contains our sinfulness. As the prophet Jeremiah wrote in chapter 17, just as he was listing out the sins of Judah that costed Judah the Lord’s favour, nobody, not even ourselves, truly knows our hearts. 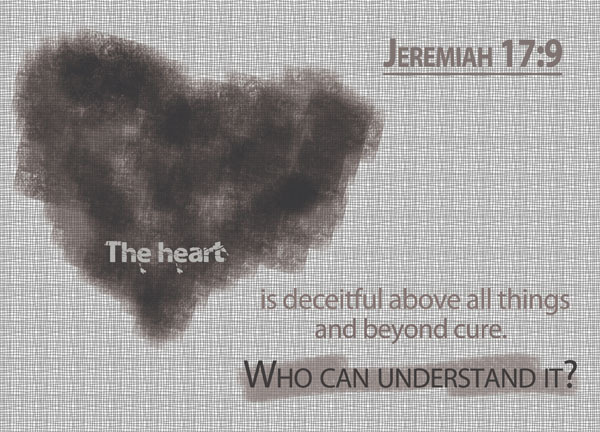 Jeremiah described the heart as deceitful above all things – two ways to understand this, first, that the heart has many qualities, but its deceitfulness is far greater than other qualities like compassion or ambition. Second, which is perhaps the more accurate interpretation judging from the translations from other versions, is that while there are many deceitful things in the world, the heart is the most deceitful of them all. The hearts of men, moreover, are full of evil and there is madness in their hearts while they live, and afterward they join the dead [Ecc 9:3]. A known enemy can be strong and mighty, but they are never more scary than the spy planted in your own camp. The liar, the traitor, the deceitful one – often taking you by surprise, catching you off guard, influencing your decisions by a series of small lies that pile up to become massive. What does it mean when the heart is deceitful? Deceit is probably one of the opposites of being upright, and a deceitful heart leads to pride, leads to idolatry, leads to sin. For this people’s heart has become calloused; they hardly hear with their ears, and they have closed their eyes [Matthew 13:15]. As humans, we have a tendency to fall into self-delusion. We are more often than not, willing to be fooled by our own hearts and unwilling to see and accept the truth that lies before us. Our deceitful hearts are described to be beyond cure. In some versions it is harshly rendered – desperately wicked; in other versions it is gently rendered – desperately sick. Beyond cure connotes being hopeless – being so bad at something that it’s unchangeable. Our hearts will always retain that deceitful nature. Our deceitful nature can be first seen from the very beginning of humanity. Deception was a theme in the lives of Adam and Eve while they were still in the Garden of Eden; their son Cain tried to deceive the Lord upon murdering his brother Abel. For from within, out of men’s hearts, come evil thoughts, sexual immorality, theft, murder, adultery, greed, malice, deceit, lewdness, envy, slander, arrogance and folly [Mark 7:21-22]. Analysis: Who can understand it? How well do you know yourself? How well do you know your own thoughts, your own desires, your own heart? Probably quite well. In fact, you may be the one person on earth whom knows yourself the best – don’t assume that this is always the case. Even so, the complexity of the human heart guarantees that we as human will never truly or fully understand our own hearts. We will never truly or fully escape being deceived by our own hearts – whether for our entire lifetimes, or even just for a minute or so. Who can discern his errors? Forgive my hidden faults [Psalm 19:12]. The one notable thing about deceit is hiding. A deceitful heart would hide the flaws and faults of a person. A deceitful person would hide his true intentions. A deceitful mind would hide its cunning and shrewd plans. Paul describes how one struggles with the sin in ourselves, that we cannot escape from even if we know it’s wrong – I know that nothing good lives in me, that is, in my sinful nature. For I have the desire to do what is good, but I cannot carry it out. For what I do is not the good I want to do; no, the evil I do not want to do—this I keep on doing [Romans 7:18-19]. This tendency can be attributed to the deceit of the heart. Should our hearts and minds intentionally hide things from our consciousness, we will never truly understand ourselves. Yet, nobody and nothing can hide us from the Lord. Not even ourselves. Nothing in all creation is hidden from God’s sight [Hebrews 4:13]. And hence that is our hope. Our only hope from dwelling too deeply within the web of lies that threaten to penetrate into the core of our lives. The deceit that stems out of our very own hearts. God is our hope, our salvation from ourselves. In God we can become new – You were taught, with regard to your former way of life, to put off your old self, which is being corrupted by its deceitful desires [Eph 4:22]. It’s not that we don’t know that we are sinful, very sinful. But because we can’t see or measure exactly how sinful we are, we often take the term ‘very sinful’ lightly. Often, it doesn’t seem like we truly understand the severity and the gravity of the term ‘very sinful’. We confess our sins half-heartedly, and we tend to think that we can challenge ourselves through our own strength. We cannot. We cannot conquer our own deceitful hearts or sinful nature by our own strength. We were never meant to be, after all, we don’t even understand how complicated the human heart really is. For centuries experts have studied and analyzed the human heart and mind, but even the best psychologists are often stumped at the behaviour of humans. There is only one sure way to overcome this. God. God is our hope against our deceitful hearts. God is our redemption and salvation. God can understand our hearts. After all, he created us. He knows best. Thank you for this accurate assessment of the human state and our only hope. Thank you for the insights into our heart conditions. Next to the tongue, the heart is the other human organ with the capability to bless as well as curse. And yet even though the human heart may be like stone, God can unilaterally transplant it with a soft and tender heart. He can even move the heart of the great Persian king Cyrus to let His people return to Jerusalem to rebuild their city and temple. God is great!